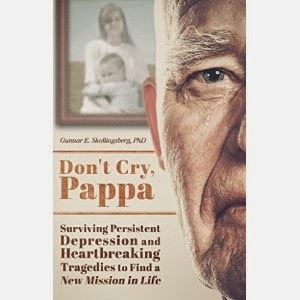 "Don't Cry, Pappa: Surviving Persistent Depression and Heartbreaking Tragedies to Find a New Mission in Life" by Gunnar E. Skollingsberg, PhD, is a touching memoir about the author's life, particularly the family-based challenges and tragedies he experienced, and a portrait of survival and hope through pain and grief. Skollingsberg walks the reader through the main events and inflection points of his life, from his early childhood memories of "feeling demeaned, worthless, and unwanted" as an isolated and abused immigrant son from Norway, to experiencing the death of two of his children, and the pains of divorce. Though these events caused the author to feel self-loathing, grief, and depression, the author shows that it is possible to press forward amidst the most heart-wrenching life experiences. Skollingsberg loves his remaining children and makes it his professional and personal mission to help other children who feel lonely and worthless as he once did. "Don't Cry, Pappa" is an incredibly well-written memoir with thoughtful reflections and overall positive messages of survival through very tough times, and specifically, the persistence of hope after the loss of a child. The author is inspiring in that he is able to repurpose his life to do good for other children after the personal losses he suffered. "Dont' Cry, Pappa" is a must-read memoir for individuals looking for a role model who can lead by example after experiencing personal tragedies and difficulty life circumstances.